Believe it or not, there was a time when short films were very difficult to see. Often treated like annoying, unmarketable little brothers to their feature length siblings, outside of the festival circuit, a rare anthology flick, or a special compilation release, shorts had very little chance of reaching a mass audience. In recent years, however, this has started to change dramatically. Now with YouTube, Vimeo, various streaming services, and the increasingly low costs of do-it-yourself independent disc distribution, the short film art form is finally able to reach a larger audience. This brings us to 'HENRi,' a sci-fi short funded through Kickstarter that is now available for purchase on Blu-ray. A visually creative rumination on human consciousness, the film features an inventive blend of practical and computer effects. While the story could have used a little more development, the moody images are strong, and the mixture of miniature and CG work is surprisingly organic. Set several hundred years in the future, the film focuses on a drifting spacecraft controlled by a human brain. With the crew long since dead, the ship's living power system, called a Hybrid Electronic/Neuron Responsive Intelligence, or HENRi for short, starts to experience brief flashes of his former life. Now growing self-aware, HENRi decides to build a makeshift body for himself out of spare parts, hoping to gain a better understanding of the various emotions and memories that continue to flood his mind. 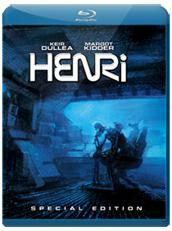 While narration and brief live action flashbacks are peppered throughout the 21 minute runtime (featuring the inspired casting of '2001' star Keir Dullea as the voice of the title character, and former Lois Lane, Margot Kidder as one of the deceased crew members), the majority of the movie simply focuses on HENRi as he assembles his haphazard metallic form. We watch as he uses the ship's equipment to fashion a shell, and then continue to follow him as he grows accustomed to his new shape, struggling to come to terms with his existence. From a purely visual perspective, these sequences are all very impressive, and there are several legitimately powerful images. One shot of the brooding hunk of metal bent over in a contemplative pose, nearly frozen in the icy ship, is especially memorable, beautifully evoking his loneliness and confusion. To achieve this bold aesthetic, the filmmakers rely on a mixture of quarter scale miniature sets, props, puppets, in-camera effects, and computer animation. Through these varied techniques, Director Eli Sasich and his crew (which includes Hollywood visual effects supervisor Clark Schaffer) create an intricately realized science fiction setting that effectively immerses the audience in the events on screen. Sasich also displays a great command of tone, and coupled with the film's gradually building score, the slow, escalating pace helps to engender a moody sense of isolation and melancholy gloom. Likewise, the character of HENRi is a wonderfully animated and fully formed creation, and it's rather remarkable just how much personality and emotion the filmmakers are able to evoke from his relatively simple design and movements. In the included special features, it's revealed that the original plan was to use practical miniatures and puppets exclusively. Unfortunately, there were some issues with the HENRi puppet, and for the most part, the character had to be replaced with a CG model in post production (about 10% of the footage still uses the puppet). While this change of direction is a pretty drastic compromise from the project's initial conception, whether planned or not, what we end up with here is a very unique fusion of two traditionally opposed technologies. By blending old school practical models with new school CG wizardry, the film becomes a delightfully understated testament to the merits of both art forms. A loving homage to the classic techniques of yesteryear, and a skillfully implemented example of 21st century innovation, 'HENRi' presents a harmonious melding of cinematic past and present. As engaging as the visual story telling is, some of the deeper aspects of the narrative do feel a little muddled and under-explored. Tales about machines wanting to become human or reclaim their lost humanity are common place in science fiction, and though 'HENRi' offers a decent example of the premise, it doesn’t really bring anything new to the concept. Heady questions about the nature of consciousness and memory are lightly touched upon, but by and large the story is fairly simple, familiar, and vague. This vagueness isn't necessarily a bad thing, mind you, but it does limit some of the movie's ultimate impact, and though the music and images ultimately swell to an appropriately dramatic crescendo, I was left a little detached from the climax. Of course, this is a short film and not a feature, so it's understandable (and perhaps even preferable) that the brief story places its emphasis more on tone and imagery than narrative details. In fact, part of me is curious what an even more experimental approach might have yielded. As it stands, the core of the idea is very ambitious, and given the relatively short runtime, the director has done a nice job creating a satisfying, and occasionally thought-provoking experience. 'HENRi' is a visually compelling love letter to science fiction wizardry. Using miniatures, models, puppets, and computer animation, the director creates a unique style that manages to seamlessly marry CG and practical effects, forming a convincing sci-fi setting and an endearingly believable central character. While the story and themes don't quite reach the same level of originality found in the film's technical artistry, director Eli Sasich maintains a strong mood and escalating rhythm throughout. A commendable example of independent short filmmaking and low budget ingenuity, the flick is definitely worth a look, especially to lovers of science fiction and old school special effects techniques. Corridor Productions brings 'HENRi' to Blu-ray on a BD-25 disc housed in a keepcase. The screen transitions directly to a standard menu upon start up. The film is available for purchase on Blu-ray (or digital download/rental) from its Official Site. The movie is provided with a 1080p/AVC MPEG-4 transfer in the 2.40:1 aspect ratio. Despite its independent low budget roots, the transfer is technically proficient, and the moody sci-fi visuals result in some cool imagery. The digital source is mostly clean and artifact free, but some minor banding is visible in a few shots. A light, grain-like layer of noise is also apparent from time to time. Though not razor sharp, clarity is resolved nicely throughout, revealing all the hard work done on the miniatures and CG effects. The tiny practical sets and props all come across as convincing, and the character of HENRi is full of little nuances in movement that add even more personality and texture to the visuals. With that said, the overall picture can be a little soft, and never reaches the same level of fine detail and dimension that's apparent in big budget productions. Colors veer toward an appropriately cool palette that perfectly emphasizes the isolation of space. Contrast is well balanced with consistent black levels, and shadow detail remains good, even throughout the spaceship's numerous dimly lit corridors. 'HENRi' features an impressive blend of miniature photography and CG imagery, and while not a real standout, this transfer does the filmmakers' hard work justice with no major technical concerns. The film is presented with an English Dolby TrueHD 5.1 track along with optional English subtitles. Though it lacks a little nuance, the mix features solid design work and does a nice job of enhancing the movie's lonely atmosphere. For the most part, voice-over narration and dialogue are nicely prioritized, and HENRi's HAL like voice comes through cleanly. Robotic sounds and churning mechanisms layer the track with sparse but bold ambiance. The effects work is a little front-loaded, but surround use is still present, spreading echoes of noises directionally around the room when called for. In the included special features, the director discusses the decision to increase the overall scope and scale of the sound effects as a means of compensating for the miniature sets and props. While this more forceful presence does help to sell the visuals, some of the sound design choices do come across as a little too aggressive and unbalanced, and there are a few fleeting moments where they seem to overpower narration just a tad. The slowly building score comes through with strong fidelity and separation, helping to create a gradually escalating rhythm that works wonderfully. Dynamic range is wide and free from distortion, and the rumbling space craft environment creates some deep low frequencies. It's a little front-loaded, but the mix offers decent ambiance and moody atmosphere with no major issues. While the decision to exaggerate the effects makes sense, the embellished sounds do lead to an occasional lack of nuance. Still, the sound design is fitting and the score is strong. HENRi Lives: The Making of HENRi (HD, 34 min) - Presented in 1080p with LPCM 2.0 sound and optional English subtitles, this is a comprehensive look at the short film's production, detailing all the challenges faced during the shoot. Interviews with the cast and crew are interspersed with behind-the-scenes footage, tracing how the creative team was assembled and how they went about constructing all of the intricate miniature models and sets. Director Eli Sasich also offers a very interesting and refreshingly candid discussion about overcoming a major obstacle that almost brought down the entire project. Longer than the actual short, there are a lot of great insights here that should make this a particularly interesting watch for budding independent filmmakers. Trailer (HD, 1 min) - A short trailer for the movie is included. 'HENRi' is a visually unique and inventive sci-fi short that probes some heady philosophical waters. While the story itself is a little familiar and underdeveloped, the mixture of practical effects and CG animation creates a striking mood and a fully believable protagonist. The video and audio are both very solid, and the included making of doc is rife with fascinating insights into the filmmaking process. This is an engaging and entertaining short film that features a strong sense of tone, cool imagery, and impressive technical wizardry, and the disc itself is very professional, belying its indie roots. This release is well worth a look!